'I loved the book! Well-written, well-focused, well-thought out. The best part is the reproducibles, which are a wonderful follow-up for using the strategies in your classroom' -Pam Jackson, Alternative Seventh-Grade Teacher Elkhorn Middle School, Frankfort, KY 'The many lessons and ideas are a treasure trove for teachers. I am keeping the book on my desk for ideas throughout the school year' -Julie Steimel, Teacher Eleanor Roosevelt High School, Greenbelt, MD Teach to students' strengths with new and enhanced activities that engage their multiple intelligences! Tired of repetitious lessons that ignore the power of student curiosity? Need an easy-to-use guide full of high-impact strategies designed to engage students' minds? 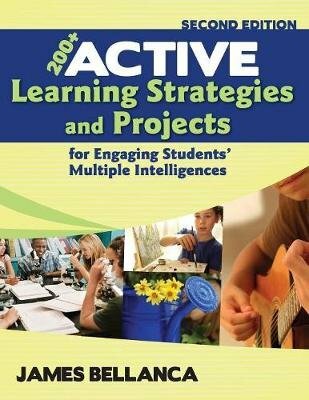 This updated edition of Active Learning Handbook for the Multiple Intelligences Classroom presents more than 200 research-based, easy-to-implement activities and brain-compatible projects for increasing students' motivation and on-task learning in K-12 classrooms. Using Howard Gardner's theory of multiple intelligences as a framework, the author provides engaging lessons that target a single intelligence while still developing other cognitive domains. Organized and cross-referenced for easy and immediate use in multiple subject areas, this resource allows teachers to access: Step-by-step directions for each activity, with an identified purpose, a targeted multiple intelligence, appropriate grade ranges, and materials needed Checklists of important procedures and tips to help teachers modify or design tactics to meet students' varied needs Reproducibles to reinforce student understanding Research illustrating what works for promoting student achievement Cooperative learning strategies for building a community of learners 200+ Active Learning Strategies and Projects for Engaging Students' Multiple Intelligences, Second Edition helps teachers transform students from passive acquirers of information into active producers of knowledge.